I created my second painting a couple of weeks ago. Although I don’t want to be categorized by a certain theme, I continued with that of sea creatures attacking humanity. This one is called (for now) : “The squid’s technique was stealth”. A few of the paints were very on sale at the supply store and I don’t think I will be using them again. The squid’s eyes and some of the oil tanker SPLOSION were using these paints which were a bit runny and their colors didn’t seem to fit what I had in mind. "The squid's technique was stealth"
You may have a few questions about my work. Q : Why are sea creatures attacking humanity? Q : Will the human featured prominently in the center survive the attack? 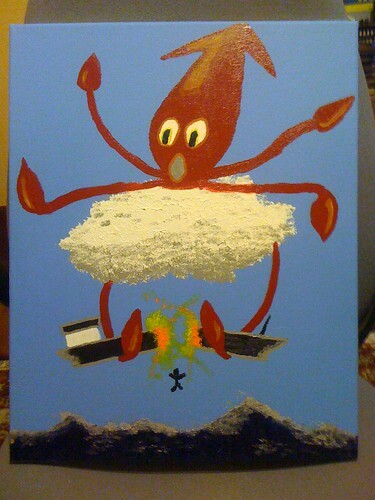 Q : How can a squid remain on top of a cloud? I don’t have answers to any of these, so I will leave them as exercises for the viewer. If you figure any of these out, please let me know. I have been looking forward to a moment like this for quite some time. A project I worked on is being shown at my favorite art gallery here in Salt Lake. I have worked on a 2+ year large scale multimedia art project with some friends which is a giant moving piece of steel from the future. It calls itself the “Jellyfish from the year 12,000”. This beast is a work of steel which is covered in shimmering materials and thousands of LED lights. These LEDs are programmed so that they can be controlled by a person on a touchscreen, or from audio or from computer generated animations. There are a lot of people I have tried to explain this project to, so I hope to see all of you at this event.